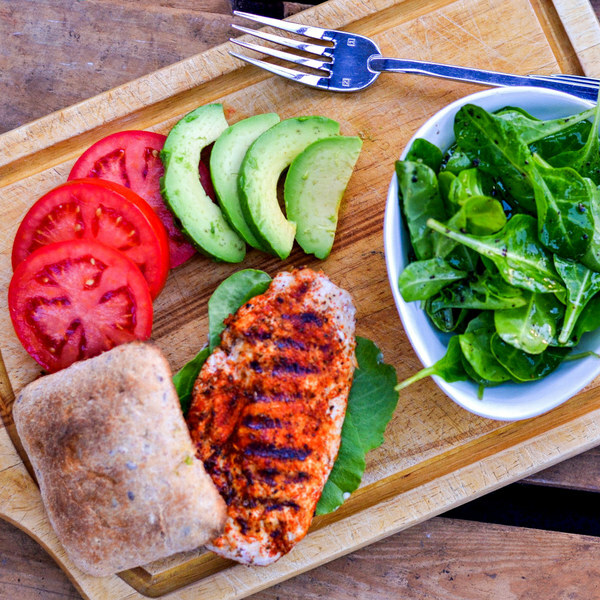 ← Cajun Chicken & Avocado Burger with Baby Spinach Salad. Heat a grill pan, outdoor grill, or skillet over medium heat. In a small bowl, prepare cajun rub by mixing together cumin, coriander, paprika, oregano, salt, and pepper. Slice chicken in half horizontally to form thin fillets. Rub with spice mixture on all sides. Coat grill or bottom of skillet with oil. Add chicken fillets and cook until golden brown and cooked through, 2-3 minutes per side. Wash and dry spinach. Save a small handful of leaves for the burgers; add the rest to bowl with dressing and toss to coat. Wash and slice tomato into rounds. Halve and pit avocado; thinly slice while still in skin and scoop out. To serve, spread some Dijon on buns. Top with remaining spinach leaves, chicken, and slices of tomato and avocado. Serve with spinach salad on the side. Enjoy!